Application Documents — Caring Partners International, Inc. Complete a ‘Medical Kit Request Form’. Please mark the items you desire to receive directly on the ‘Medical Kit Packing List’. Our staff will note this and contact you with any questions or specifics. If your church team has an additional medical material or equipment request, note this also. At least SIX WEEKS prior to your Mission Trip date, send the ‘Medical Kit Request Form’ and the completed ‘Medical Kit Packing List’ to Caring Partners International: 601 Shotwell Drive, Franklin, OH 45005. Caring Partners will notify you when your Medical Kit is prepared. A representative from your church will need to come to the Caring Partners warehouse to pick up your Medical Kit. If unable to do so, email or call the Caring Partners office at (937) 743-2744 to make shipping arrangements. Your church will be responsible for any shipping costs. 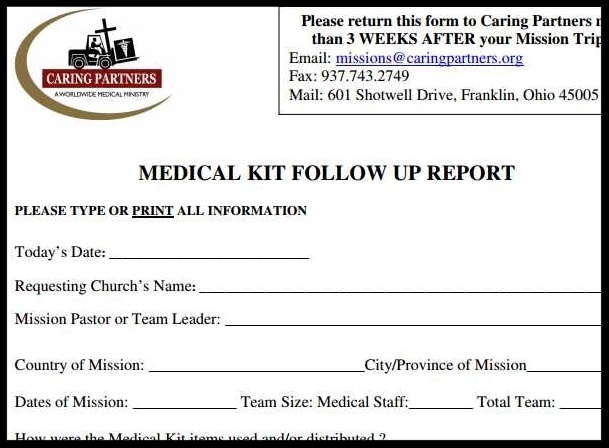 No more than THREE WEEKS after your Mission Trip, Caring Partners requests that your Mission Team or US Church Leader complete and send the ‘Medical Kit Follow-Up Report’. Please contact Andrew Wienhoff at a.wienhoff@caringpartners.org or via telephone at (937) 743-2744 if you have any questions.